Season 13 of Great Performances at the Met comes to primetime with Verdi’s masterpiece La Traviata, premiering nationwide Friday, April 5 at 9 p.m. 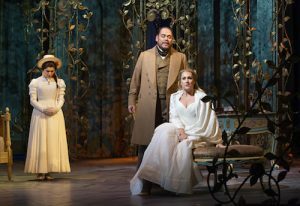 Conducted by new Metropolitan Opera music director Yannick Nézet-Séguin, the opera stars Diana Damrau in the pinnacle soprano role of Violetta alongside Juan Diego Flórez as her hapless lover Alfredo and Quinn Kelsey as his father Germont. • La Traviata marks conductor Yannick Nézet-Séguin’s first new production since becoming the Met’s music director in September 2018. Nézet-Séguin’s previous Great Performances at the Met appearances include Carmen (2010), Don Carlo (2010), Faust (2012), Rusalka (2014) and Otello (2016). Corporate support for Great Performances at the Met is provided by Toll Brothers, America’s luxury home builder®. Major funding for the Met Opera presentation is provided by the National Endowment for the Arts. This Great Performances presentation is funded by the Anna-Maria and Stephen Kellen Arts Fund, The Joseph and Robert Cornell Memorial Foundation, Ellen and James S. Marcus, The Philip and Janice Levin Foundation and public television viewers.